This idyllic new property offers a lakeside experience of one of the most stunning locations in Snowdonia. Over 4 acres of private, secluded woodland add to the rural magic. 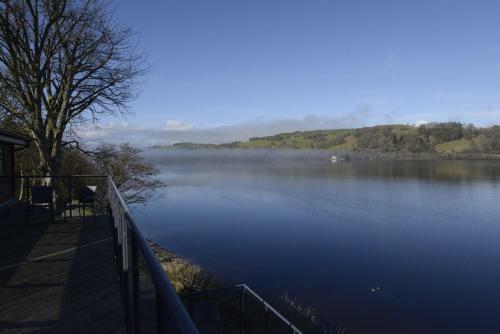 The dining room, the lounge and the guest rooms at Glan Y Gro Bed and Breakfast offer some outstanding views of Bala Lake. The Lake (Llyn Tegid) is the largest natural lake in Wales and teeming with wildlife. There are are also no shortage of watersports to enjoy here, including kayacking and canoeing. There's a warm and enchanting lodge-style vibe to the property with floor-to-walls windows looking out in all directions and heaps of natural wood. This is a beautiful and spacious option that families (especially in the West Wing) are going to love. The Seven en suite rooms are all en suite and you have free wi-fi on demand. The double bedded room (the Areni) has double views of the lake. A charming narrow gauge steam railway intersects with the grounds. The National White Water Centre is nearby. A big 'yo' for the Glan Y Gro!